Cadets Winter Percussion will join the Independent World division in 2015. The Drum Corps International Tour ends in August each year, but for a good number of organizations, winter is more than just a time to plan for next year. Members and staff are busy preparing for an indoor season that culminates with the Winter Guard International World Championships, which will kick off this week in Dayton, Ohio. For 2015, WGI has added a new Winds Division to join its Color Guard and Indoor Percussion classes. Those groups will settle their competitions over two weekends. Indoor Percussion gets things started today (April 9) and runs through the Finals on April 11. The Winds championships will take place on April 11 and 12, followed by the Color Guard World Championships on April 16-18. DCI fans in Dayton can expect to see some familiar faces on the floor. Aside from individual group members who winter with WGI organizations, several DCI groups have a strong (or growing) tradition in WGI competition. Formed in 1998, Riverside Community College (RCC) Indoor Percussion?”which recently joined forces with the Blue Devils organization?”has been among WGI's most successful groups. The WGI Independent World Class (PIW) group has never finished outside the top four, earning four world titles along the way. Another PIW group, Blue Knights World Percussion, is the offspring of the Denver-based DCI group of the same name. Since its founding in 1993 (the same year WGI Percussion competitions debuted), BK's indoor group has earned four WGI World Championships, finished in the top three nine years in a row, and has failed to reach the top 15 only once. After winning WGI's 2014 Independent Open Championship title in the group's inaugural year, Allentown, Pennsylvania's Cadets Winter Percussion will graduate to the Independent World class for the 2015 season. The group can look for inspiration in the success of its 10-time DCI World Champion parent organization, which followed the percussion group's winning debut by launching the Cadets Winter Guard to compete in WGI's Independent Open Class this season. "[Whether] Cadets, Cadets 2, or Indoor, the lessons are the same and the philosophy is the same for us," Cadets Director George Hopkins said. "So as long as we can afford it, we will do these programs and hopefully many more." A five-time finalist in WGI's Independent Open division, the Cavaliers' percussion ensemble?”formerly known as "Green Thunder"?”will be stepping down this season to make way for a new Independent World ensemble, Cavaliers Indoor Percussion. The Cavaliers intend to maintain both groups, leaving Green Thunder inactive for the 2015 season to return in 2016 as a Class A or Open Class ensemble. Santa Clara Vanguard has a long history of fielding both percussion and color guard ensembles. "We believe our winter programs offer multiple benefits in our community," Vanguard CEO Jeff Fiedler said. "Current members who wish to be involved nearly year-round with Vanguard get to work with many of the same staff and have the same quality experience they do in summer." SCV's winter guard, a two-time title winner and consistent finalist, will compete in the Independent World class. The organization's percussion ensemble will also compete in the Independent World division, having won an Open Class gold medal in 2011. "Between the two DCI corps (World Class Santa Clara Vanguard and Open Class Vanguard Cadets) and the two winter programs, we provide at least one Vanguard experience to more than 350 members," Fiedler said. Other DCI groups with WGI connections include the World Class Oregon Crusaders, which fields both percussion and color guard groups under its banner, Bluecoats' Artistry in Blue Winter Guard (Independent A class), Legends Winter Percussion (Independent Open), the Raiders-affiliated East Coast Percussion (Independent A), and Blessed Sacrament, a long-established color guard that now competes as part of Inspire Arts & Music, the parent company of the Boston Crusaders. Then there's River City Rhythm Indoor Drum Line. This WGI PIO group is serving as the foundation for a prospective entry in DCI's Open Class this coming drum corps season. But whether it's DCI corps members finding some winter solace or WGI members keeping busy over the summer, the combination of indoor and outdoor marching keeps them involved as much as possible. "Before, when I would come home from Dayton, I wouldn't see all these people I had just spent months and months loving and getting to know for half the year," says Ian "Frank" Maxwell, who joined DCI's Blue Knights after spending time in the organization's indoor percussion group. "The [growing] bond is why I always come back to both." 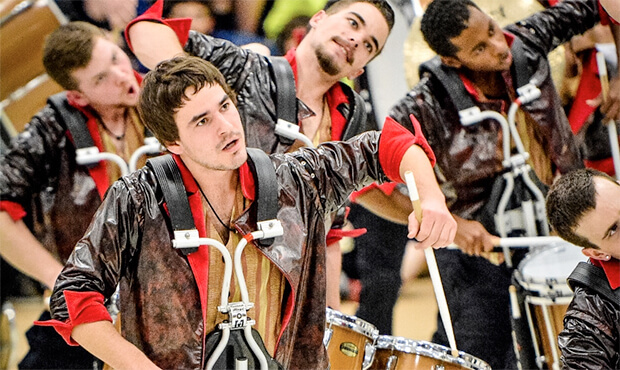 Learn more about the WGI Sport of the Arts World Championships.